Nikolai was politician who increased his rank in The Bolsheviks party by killing next man in line and marrying politically. Nikolai's way to kill his wives finally got to a stop when he killed his 5th wife with axe. Little did Nikolai knew that his wife had been sleeping with a high ranking party official. Nikolai’s reputation spread quickly through the party, and it wasn’t long before Stalin himself had heard about the psychopathic politician who killed anything that came within 5 feet of him. When war started, Nikolai was dropped at the front line. So ended Nikolai's glamorous politician days. Nikolai got depressed and tried to forget his troubles with Vodka. 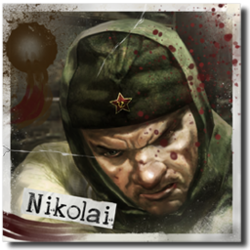 Nikolai is true killer and doesn't avoid any means to get what he wants. In the battle ground Nikolai's luck wasn't going to turn. In the Battle of Berlin Nazis captured Nikolai. Belinski was not going to be ordinary prisoner. Group 935 picked him from the group of prisoners to be studied with. Dr. Richtofen erased Nikolai's memory and started studies with him. Nikolai started to finally respond to Richtofens stimuli but only after he was injected with new serum made primarily from vodka. Nikolai was soon to find himself fighting against zombies with crazy German doctor and Japanese and American soldiers who seemed to be as confused as him. One thing Nikolai didn't forget is his lust for Vodka and how he murdered his wives. But all he wants now is to survive. For some reason Richtofen seems to like Nikolai most from the test subjects. Nikolai also is friend of Dempsey and they get drunk together. Its unknown why Nikolai hates Takeo. All we know about Nikolai's family is that he has brother-in-law, sister and daughter. Also his first wife might been his relative. Takeo has nothing left in his life except to try maintain his honor. He ponders this and other philosophical questions as his Katana slices through the flesh and sinew of his enemy. Takeo's family was very wealthy. His family dynasty dates back several centuries, and throughout that time they have been highly decorated Samurai and Bushi. His family was very proud of Takeo and knew he would bring honor to the family name. Until Takeo slaughtered his entire family for their insolence. Takeo joined military and quickly ranked his way up to a Captain. 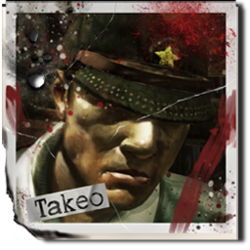 Takeo was taken as prisoner by Group 935 near Shi No Numa facility. And sent to be tested by Dr. Richtofen. There he was given the name: Test subject N3WB. Richtofen almost completely destroyed Takeo's mind when he erased his memory because of that Takeo only stared at the floor muttering what sounded like some kind of proverb over and over again. Despite Takeo almost completely losing his mind in the test. He is gaining his memory back the fastest from all of the test subjects. Takeo has rough time travelling with the others as he really doesn't like any of them. He is also getting sick all of the time from using the teleporters. Takeo is starting to remember everything that Richtofen did and wants his revenge and is going to kill Richtofen, that dishonored coward who made all those things to him. After the episode in Moon Takeo promises to destroy Richtofen once and for all as well as taking down the remains of Group 935. Tank Dempsey is a guy who you really don't want to piss off, if you make that mistake he will make you regret. He is typical american hero, who is happy if he has loaded gun, wife and something to shoot at. Dempsey was part of a Marine Raiders, the elite infantry units of the USMC. Only best of the best are chosen to the Marine Raiders. His unit was captured during the early raids before the main invasion at the battle for Peleliu. He spent two weeks in a rat infested bamboo cage submerged in malarial water. Eventually, he gnawed his way through the cage, and then gnawed his way through his captors armed only with a Bobby pin and his Medal of Honor which he keeps secreted in various body cavities. After the events of Peleliu, Dempsey was chosen to lead a top secret mission which was to extract person called Peter. All they knew about the mission was that Peter was presumed to be located in a top secret location known only as Verruckt. When the marine recon unit was close to the asylum Dempsey decided to go and recon the facility before the others come. For Dempsey's misfortune Group 935 caught him from spying. 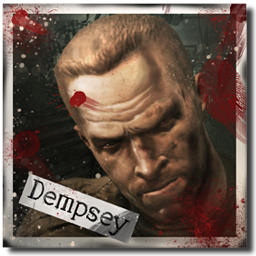 So Dempsey was to become another test subject of Dr. Richtofen who wanted to create super soldiers that Maxis wanted. Like the others also Dempsey is slowly gaining his memory back after Richtofen erased it. Dempsey hates Richtofen. His hate started at first moment he saw Richtofen and erasing Dempsey's memory didn't remove it. Dempsey seems to have some respect towards Takeo, maybe because of the events at Peleliu and how he saw Japaneses soldiers there. Edward Richtofen was feared in the towns of Germany, "Beware The Doc" was the message that was scrawled across walls of every town under Axis control. Dr. Richtofen worked as a back alley plastic surgeon. He created an army of monstrous affluent Weimar socialites that would follow him around and laugh at every joke the genius doctor made. When the republic fell and the Nazi party took control, he lost his followers. Richtofen didn't like Nazi party values because they were too moral, too liberal for his liking. Only thing that made him join the army was to satisfy his need to watch people die, slowly. He's an incurable sociopath, and he sees no moral distinction between natural death and murder. The victim is a victim, regardless of how their demise manifests itself. He likes to stuff animals and pose them into positions of terror at the instant moment before of their death. Because of his dislike toward the Nazis Richtofen joined the Illuminati, who had a job for this crazy but very intelligent doctor. The Illuminati wanted Richtofen to infiltrate to the Group 935, where his job was receive everything that Group 935 had so they could rule the world. Richtofen started his new job as Maxis' assistant, and they made many tests together. Richtofen invented a new weapon of mass destrcution that could be deployed to infantry soldiers. This weapon was called Wunderwaffe DG-2. It was powered by the new element Group 935 had discovered, Element 115. Exited by this new Element 115 he also created other projects like Monkey Bomb. Dr. Richtofen wrote also book about his DG-2 and DG-3 projects. Maxis wanted to create super soldiers and that is how Richtofen met the crew. The test subjects were chosen to be Nikolai Belinski, Takeo Masaki and Tank Dempsey. 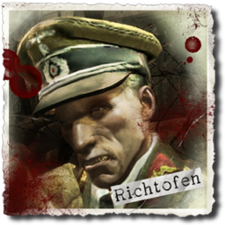 Richtofen was supposed to continue observations after he made the tests to the test subjects. Richtofen had some secret projects behind Maxis back also, he did some experiments to Samantha who was Maxis' daughter. As well as started to study an ancient Vril machine and created with help of other 935 scientist a Griffin Station to the Moon. Richtofen decided to kill Dr. Maxis and his daughter Samantha by trapping them in a room with a hell hound that was created by accident. Dr. Maxis had became obstacle in Richtofen's plan to control the army of the undead. By this time Richtofen had learned what Element 115 and Vril power were capable of. He didn't want to give such a power to the Illuminati, so he betrayed the Illuminati and decided to rule to world himself. He started his journey with his super soldiers, (who didn't know what was going on and just wanted to survive), to collect required pieces Richtofen needed to rule the world. Richtofen had found a pyramid that was made by Vril aliens on the moon. He called the pyramid M.P.D. and that's why he started to create Griffin Station with some of his Group 935 colleagues. In Griffin Station they started to research the pyramid and found the key to teleportation. Soon Richtofen made the plan to kill Maxis and Samantha. But things went wrong when Maxis and Samantha teleported from Der Riese. Samantha was trapped in the M.P.D and from there she was able to take control of the zombies. Richtofen's plan was to change bodies with Samantha using the Vril-generator and focusing stone. By changing the bodies Richtofen was able to take control of the zombies. Will this alien pyramid give him the power to dominate the world or just give more problems? The pyramid was after all the thing that made Richtofen hear voices! Ludvig Maxis was German scientist who was chosen to lead international and top secret group called, Group 935. German government wanted to start projects that would help them to win WWII. So Maxis and his scientist started to develop new weapons and devices that were all based to new element found. This element was Element 115. Richtofen had daughter called Samantha who was in the facility called Der Riese with him. Its unknown why Maxis brought his daughter middle of horrible experiments. Maxis primary objective was to create army of undead. With this army the whole world would finally follow the Nazi ideology. But the experiments horribly wrong, Maxis couldn't get control on the zombies, this resulted in world wide zombie apocalypse. But that wasn't the last problem Maxis had, because little did he know he would be betrayed by his assistant Edward Richtofen. When Maxis was teleported from Der Riese he got stuck in Aether. The Group 935 workers who betrayed him and worked in Griffin Station had to find Maxis, so they could get Samantha out of the pyramid. When they managed to get Maxis to Samantha, he ordered Samantha to kill the Group 935 workers at Griffin Station. Maxis died somewhere in the Griffin Stations when zombies infested the place. But before his death he made back-up plan. And as Maxis had planned the 115-rockets hit the surface of the Earth after Richtofen took control. But the explosions were much bigger than he had calculated. Its unknown what where the locations that Maxis wanted to destroy and how will that affect Richtofen's plans? Daughter of Ludvig Maxis, approximately 6-10 years of age. Her presence at the Der Riese is unknown but she must have possessed some kind of power that would have been useful for Group 935. In such a weird place Samantha tried to live normal little girls life and played with her toys like teddy bear and Mr. Monkey. What she loved the most was her dog called Fluffy. It was present from his father Maxis. But Fluffy was to come later test subject of Maxis an to be turned into hell hound. It's known that Richtofen did experiments to Samantha behind Maxis back, but we still don't know what he did. But for some reason Richtofen wanted to get rid of Samantha too and not only the L. Maxis. Finally Samantha was trapped with his father in a room by Richtofen. What made the situation sticky was that they shared the room with hell hound. Maxis tried to save himself and Samantha by using unfinished teleporter. In result Samantha was trapped in the pyramid Richtofen had discovered from the Moon. From the pyramid Samantha got power to control the zombies, hellhounds and to drop power ups. When Richtofen discovered this he made plan to change bodies with her. After Richtofen succeeded in it Samantha got trapped in Richtofen's body and she had to fight against the zombies with the three heroes. Samantha promised to revenge the things Richtofen did to her and her father Ludvig. Time will tell if she gets her revenge and body back. American spy who infiltrated into Group 935 as a research assistant based out of Munich. His employer Majestic-12 wanted him to secure all viable group 935 research of element 115 technology. Peter was transferred from Der Riese facility to Verruckt. After Peter hadn't contacted them for a while they believed his identity had been compromised. So they sent Marine recon unit leaded by Tank Dempsey to extract Peter. The mission failed and Tank was captured and rest of the team was killed by zombies. Peter was fooled by Richtofen to come into Shi No Numa, where Richtofen murdered Peter and made it look like accident. Will we ever know what information Peter possessed before he was murdered? British treasure hunter and adventurists, who went to search mystical place at Himalayas called Shangri-La with his assistant Gary. Their adventure wouldn't been same as they have had before, not just this place travel in time but its also filled with zombies! With the help of locals Brock and Gary find their way into Shangri-La. Gary accidentally activates eclipse and horde of zombies attack them. They manage to escape into some sort of cave under the city. Brock studies the cravings in the caves but it seems they aren't ancient as he thought also he has picture from some sort of tattoo. And the numbers in tattoo match the cravings in the wall. He thinks its some sort of code: 16, 1, 3, 4. For some reason Brock and Gary are not ever getting away from the Shangri-La as they are going infinite circles and as they get out of the cave the whole thing just starts again. Will Brock and Gary ever get out of the Shangri-La? What is the code and cravings he is talking about? Scientist working in Ascension Group. He first was working in Project Mercury, but was transferred to work with rockets by Dr. Gersch. Dr. Gersch thought that Yuri was incapable of handling "Project Mercury" that was the development of Gersch Device. AK64-A experiments that were about developing rockets didn't make Yuri happy. Yuri was working on Element 115 secretly and decided that when time is right he will be conducting "Project Mercury" research on his own. Yuri started to become more hostile towards other scientist on the base. And he had frequently been seen muttering to himself. Maybe because Element 115 had started to affect his mind. Because of this behavior Dr. Gersch started to think if he should replace Yuri with other scientist. Yuri was also seeing a lot of children toys, like toy box, teddy bear and matryoshka doll. Soon Yuri completely lost his mind and started to hear voices that asked favor from him. It seems that Samantha was behind the Yuri's voices and made Yuri finally trap Dr. Gersch into Gersch device. After the event Yuri suddenly started to regret what he did. Its unknown what happened to Yuri afterwards. Are we going to see Yuri again or was he killed in Ascension's zombie apocalypse? Sophia was working in Der Riese facility as Maxis' assistant and she was communicating between Group 935 and Reichstag High Command. Sophia was having a crush for Maxis and was looking him often. Maxis started to think that Sophia was distraction for his work. He was planning in sending Sophia away. Its unknown if he sent Sophia away before outbreak in Der Riese. If so, she could still be alive and help for our gang. Schuster and Groph both worked at the Griffin Station, helping Richtofen in the examinations of M.P.D and in plans to betray Maxis. Dr. Groph was the superior of Schuster. They both were killed in the outburst of Samantha resulting in zombie outbreak in Griffin Station. As said, great job. I am thinking of a thread topic now Matuzz for us. But until then, keep rockin' on! I think the reason Maxis brought Samantha with him is because he wanted to keep her close. Keep her safe. Might be, but I wouldn't think that Der Riese would be safe place. But if Maxis didn't had any other place to locate Samantha he had to take her to the facility. I threw Brock into the thread. This will have when finished much much more more characters.